I made use of your tutorial. Good tutorial! ^w^ Thanks for doing it! Every time - thanks for your tutorials! I think it's kind of cheating to just use different settings and layers to make a few scribbles look shinier and call it blue magic..but, it's pretty nonetheless. Is Paint Tool SAI or Photoshop easier/better to use? Looks like a soul from The Host. Theres no actually explanations. This this kinda shows what the stages look like. The description is so brief its really not that informative. This is a work log at best. Ignore the people who say this isn't tutorial, they're just wasting they're time trying to bring down an AMAZING artist like you! You don't need to, it's obvious what he's doing. Well you're not me so you can't determine how obvious it is to me. is not really a tutorial. If you can't make out why, you never will. 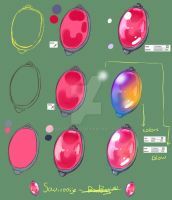 Note that artist shows step-by-step VERY basic effects which you should be able to repeat just by looking at the shots. Yes, it's a tutorial. A graphic one. My mistake, I see his instructions in the description. Minimalistic, yes, but I can see how they'd help. Sometimes he gives instructions, sometimes he doesn't. This is not a tutorial, however. Graphic ones usually give a least some explanation. I miss some text here and there. I don't can tell to much about what she is doing from step to step. But I get the idea, thanks.